l43a2: whats the deal around using NATed ip's ? Is this potentially why my RDP/http server publishing doesn't work, and why I couldn't sign up for "unblock-us" (error: your IP is already in use)? I haven't had a chance to look into it yet, and it hasn't been a priority. hmmm, I wonder if that might actually work? Regs, if you get that error then try using the unbock-us DNS without signing up, does it work? they only use IP adress for verification, no other method. so if they think it is already in use, then it should just work. If you do, just submit a support form on our website requesting one. If the CG-NAT means I cant use RDP or run a web server then that's going to be a problem. No static is ok, with Dynamic DNS, but I regularly need to connect into 'home' in order to do network/site tests etc, and I give my family (who are overseas) access to a self hosted website (ssl/443) so they can browse our photos without the hassle of picking and uploading them to facebook/flickr etc. just request a public IP and we can sort that for you, hopefully that will solve your problems. Yep, I plan to do that. Again. But I now have about 220GB of photos and home movies now, and at ADSL1 upload speed of 768kbps its going to take me at least a month of nonstop uploading. 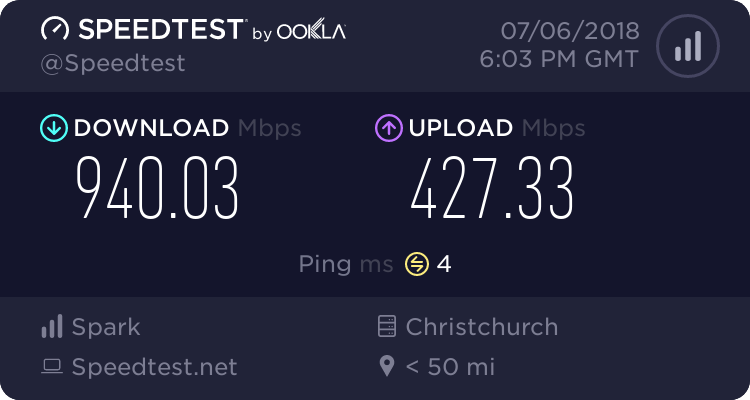 When I can get my act together i'll physically shift the home PC to a fast connection for the initial transfer, then bring back home for the incrementals. Regarding the CG-NAT, I sent a support request through to get a public IP address and received a response saying they are not available, and it's not possible right now. I use mine to provide access to the recording scheduler on my HTPC, and this has now broken that quite a bit. As mentioned by someone else, don't mind using DDNS if static IP's are unavailable, but need a public IP for sure. metalla: Regarding the CG-NAT, I sent a support request through to get a public IP address and received a response saying they are not available, and it's not possible right now. If that was a week ago or more then we hadn't made that decision back then, sorry. Put another request through now and it should get sorted. So I've been getting this to Valve's aus servers since the weekend. I'm assuming it's a problem on their end but they're pretty much impossible to get a hold of and it seems strange that no one else seems to be having issues. Dunno they seem to constantly have routing issues with their aussie servers. you should have one now. There was just a bit of confusion as whilst we knew we were going to do it, we thought it was going to take a week to get the process sorted (it didn't), but anybody who has asked for one now should be able to get one within a day or so. A word or warning though. We only have very limited availability for public IPv4 addresses, so if too many people request them we may have to consider charging for the service or stop offering it altogether. Base on current projections, we should be fine. But I can't make any promises. Basically, don't request one unless you actually need one and it should all be fine. Pretty please.